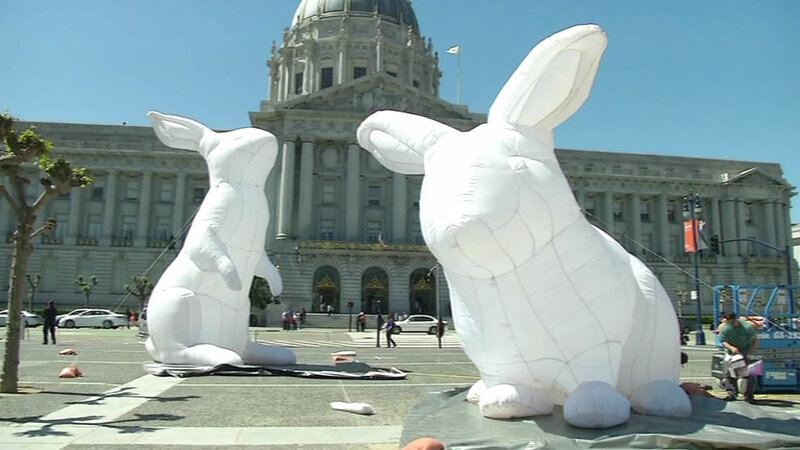 SAN FRANCISCO, CA -- Several large illuminated rabbits installed at San Francisco's Civic Center Plaza will have round-the-clock security until the exhibit comes down late this month. The giant, 23-foot-tall inflatable bunnies are part of a public art installation designed to raise awareness about Australia's rabbits, introduced by early settlers, that are now an out-of-control pest. To prevent the kind of vandalism that hit Super Bowl 50 artwork earlier this year, the bunnies will get 24-hour security from now until the exhibit ends on April 25. The two-story art piece entitled "Intrude" by Australian artist Amanda Parer toured much of the world before arriving at the steps of City Hall. Kate Patterson of the San Francisco Arts Commission says the exhibit is ideal because it's in a space where people can come and enjoy it and "take what they want from it."